It is now well recognised that the texture of foods is an important factor when consumers select particular foods. Food hydrocolloids have been widely used for controlling in various food products their viscoelasticity, emulsification, gelation, dispersion, thickening and many other functions. 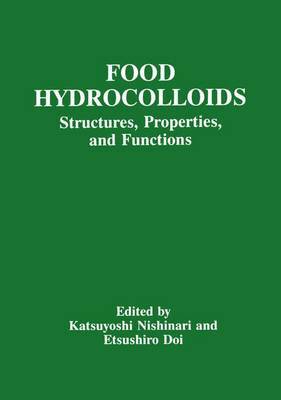 An international journal, FOOD HYDROCOLLOIDS, launched in 1986 has published a number of stimulating papers, and established an active forum for promoting the interaction between academics and industrialists and for combining basic scientific research with industrial development. Although there have been various research groups in many food processing areas in Japan, such as fish paste (kamaboko, surimi), soybean curd (tofu), agar jelly dessert, kuzu starch jelly, kimizu (Japanese style mayonnaise), their activities have been conducted in isolation of one another. The interaction between the various research groups operating in the various sectors has been weak. Symposia on food hydrocolloids have been organised on several occasions in Japan since 1985. Professor Glyn O. Phillips, the Chief Executive Editor of FOOD HYDROCOLLOIDS, suggested to us that we should organise an international conference on food hydrocolloids. We discussed it on many occasions, and eventually decided to organise such a meeting, and extended the scope to include recent development in proteinaceous hydrocolloids, and their nutritional aspects, in addition to polysaccharides and emulsions.